This recipe is inspired by the region of Campania in Italy. Place pita breads in single layer on baking sheet. Toss cheese with 2 Tbsp. pesto; spoon onto pitas. Bake 7 to 10 min. or until cheese is melted and edges of pitas are golden brown. 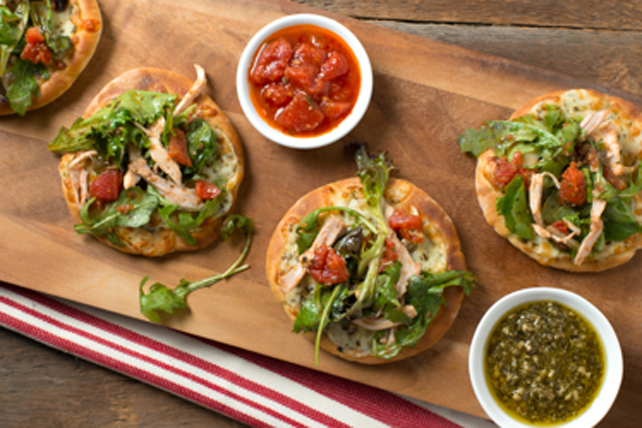 Meanwhile, toss salad greens with chicken, bruschetta and remaining pesto. Spoon greens mixture onto pitas; cut in half. Substitute Cracker Barrel Shredded 4 Cheese Italiano Cheese for the mozzarella. Garnish with sliced black olives, if desired.